Video Booths allow your guests to instantly send video postcards to their friends and family by email. Video messages are viewed from your own fully branded webpage where additional features and offers can be presented. Video results can also be automatically ‘topped and tailed’ or intercut with pre-recorded footage or marketing material. Video Postcards offer an excellent revenue generating and marketing opportunity, allowing your visitors to market your attraction and direct their friends and family straight to your website. 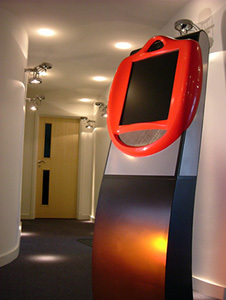 Our Video Booths are an ideal way of gathering the real opinions of your customers, employees and community. Our exclusive technology allows you to quickly update questions, graphics and settings – responding to your current campaigns or promotions. The custom touch screen interface can also collect other valuable information such as names and addresses along with multiple answers. Our completely customised and fully themed broadcasting booths allow your guests to star in their own DVD souvenir! Using the latest ‘Green Screen’ Chroma-Key technology our video booths can transport your guests into limitless virtual locations. Read the news from a far off galaxy, become the star of a televised music show or create your own 3D horror movie. Video footage can be automatically edited with pre-recorded footage and special effects. The end results are then available on a high quality DVD as a unique memento. The possibilities are only limited by your imagination; contact us to discuss your ideas. We are always looking for exciting new uses for our technology. With a team of designers, programmers and engineers, we have the knowledge, expertise and experience to bring your ideas to life. Just give us your brief and challenge us to come up with a solution! Site by Gecko 55 and with kind support from the Kerry Enterprise Board Ltd, The Irish Government and the E.U.